The west-bound Salem Avenue bike lane was clear Monday, but the sidewalk wasn’t. Where to put your garbage and recycling cans on the weekly trash day is a perplexing and occasionally vexing question without a universal solution. Luckily, it doesn’t matter as long as everybody realizes there are no easy answers and acts accordingly. 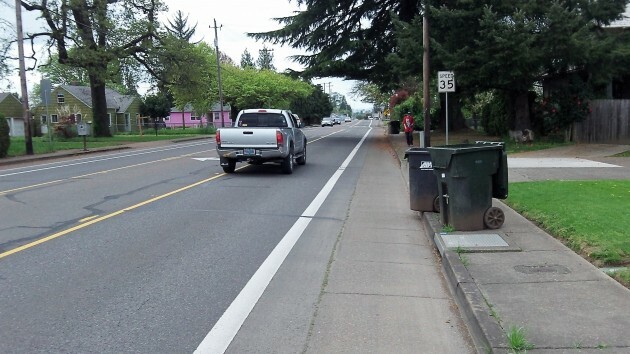 Placed in the bike lanes, trash cans may force cyclists out into traffic. Put the bins on the sidewalk and you’ll interfere with pedestrians and may even completely block somebody who uses a wheelchair. Balance them in the parking strip, they’re likely to tip over. And once the trucks have come by, the cans they leave behind are never in exactly the same spot anyway. Council members were not inclined to go as far as to make a new law or get the police involved. They pretty much agreed that talking about the issue, making residents aware of the potential for accidents and such, and relying on people’s good sense were the way to go. Because of the great variety of conditions on Albany streets – sidewalks or none, parking allowed or not, bike lines or no lanes, parking strips, ditches or gutters, and so forth – writing a regulation would be as hopeless as trying to enforce it. When I used to ride my bike on Gibson Hill Rd while being forced into the 45mph traffic lane to dodge trash cans I was definitely frustrated. Especially when people weren’t considerate about keeping them from blocking the bike lane as much as possible. Maybe the best way to deal with this is to treat it like the pan handling law at the train station overpass where drivers are responsible for enabling panhandlers. Make Republic Services responsible if they dump illegally parked trash cans. It will only take once or twice of no trash pick up to resolve the issue. If they don’t pick up the cart, it’ll just sit another week. Frequently, Republic IS the problem. People will place their carts the best thy can and Republic will leave them overturned, etc. Don’t bother with calling the customer service number. Just post a picture of the transgression on their Facebook page. They delete it immediately, but DO respond to you. The main problem I have is people that leave there carts in the bike lanes for days at a time. One can understand that not every street is conducive to traffic and trash carts. Maybe a $5 “privilege tax” /day/container after the 2nd day they remain out for chronic abusers. Some bicycle folks need to loosen their shorts so they can think more clearly. I was driving a road tour route near Sisters and came upon a support worker for a bike tour. She had me pull toward the road edge, but there wasn’t enough room to completely clear the lane. group of happy cyclists came past. BANG, water bottle bounces off the roof and marks the paint. Sure makes me want to back cycling…………..